It has been awhile since I’ve shared a home tour. 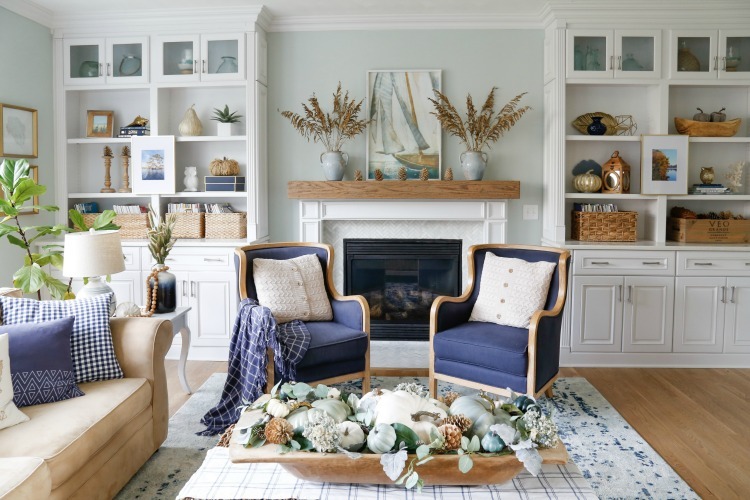 The last update was in spring when I decided to add more color to our family room; that color being navy. Navy is nautical, navy is coastal, navy is CLASSIC! For this autumn I didn’t want to overthink or over stylize our home. 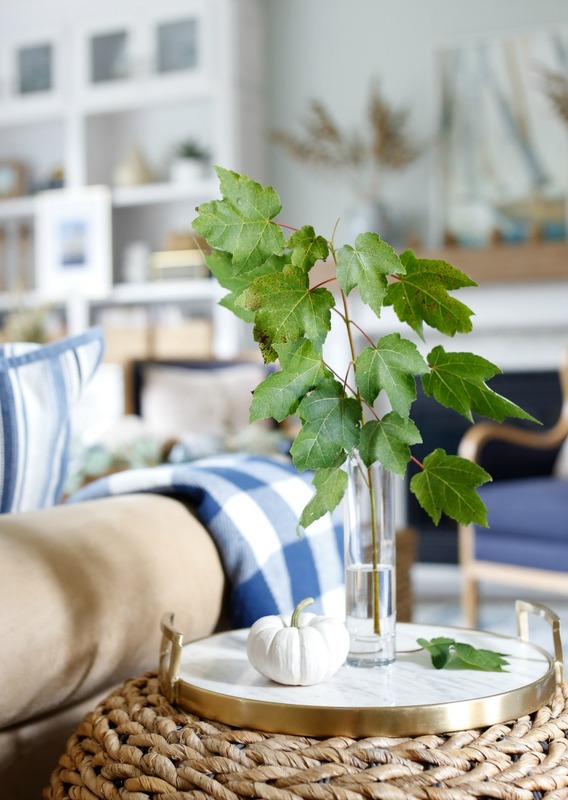 I told myself not spend money on fall decor, and simply re-work what I already have, to create a relaxed, cozy, coastal fall home. 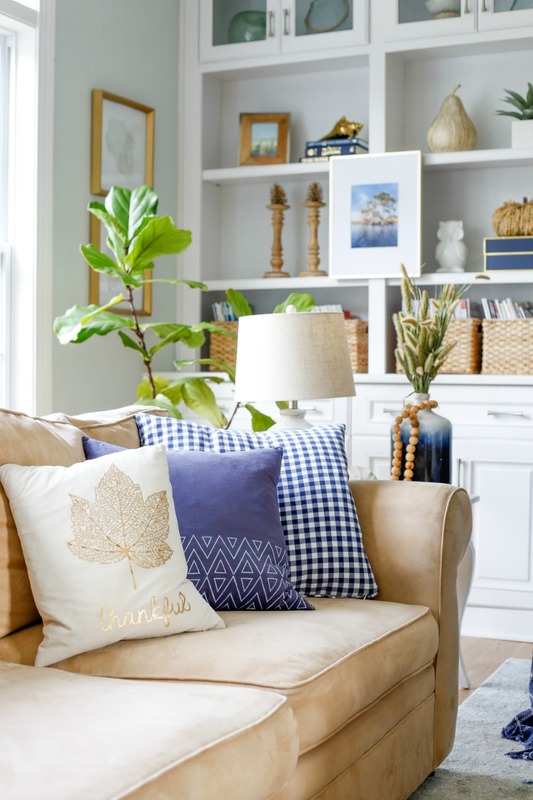 Let me welcome you to my Navy and Neutral Fall Living Room + Kitchen Tour! And not to just toot my fall cornucopia horn, I’m so happy to share some of my favorite girlfriends’ fall home tours too! Special thanks to Sheila of Maison de Cinq for hosting Autumn’s In The Air Blog Hop. If you are hopping over from the very talented Kim Savvy Southern Style, then let me give you a big welcome! 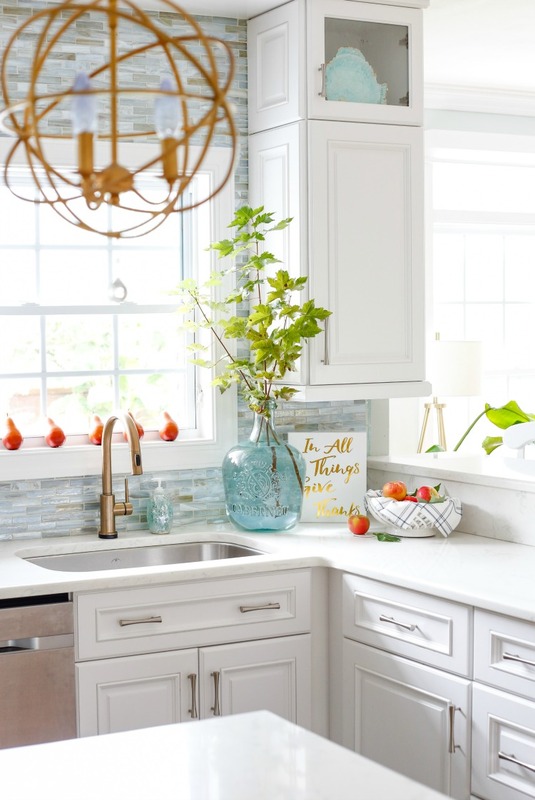 The full list of amazing bloggers on this fall home tour is listed below. My fall storage bins are stored in the attic and I went up there and took inventory of what I had. We all collect and horde items and after awhile the “things” collected and accumulated can became practically obnoxious. This year I said, let’s use what we have and casually switch over the space. Navy and neutral was my theme. 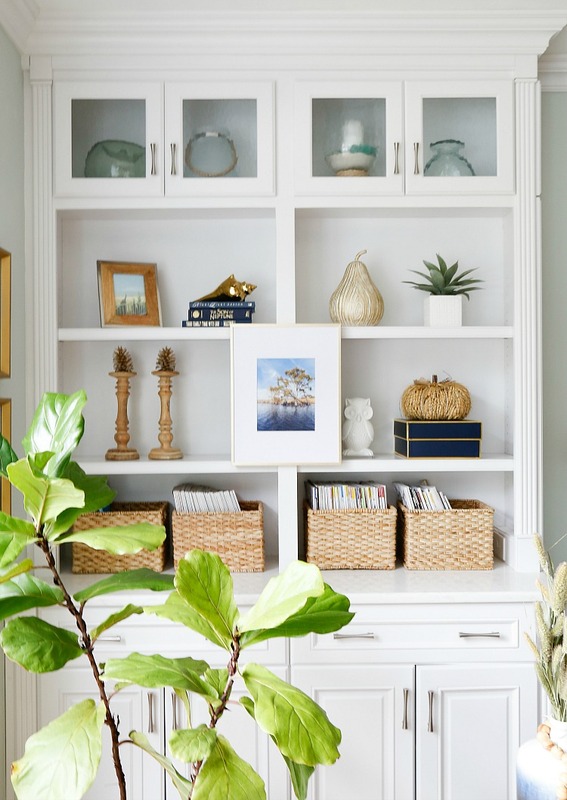 The book shelves were kept simple, emphasizing a color palette of natural wood, gilded accessories, rich navy textiles and fresh and live greenery. Decorating our bookshelves is always a fun challenge each season. 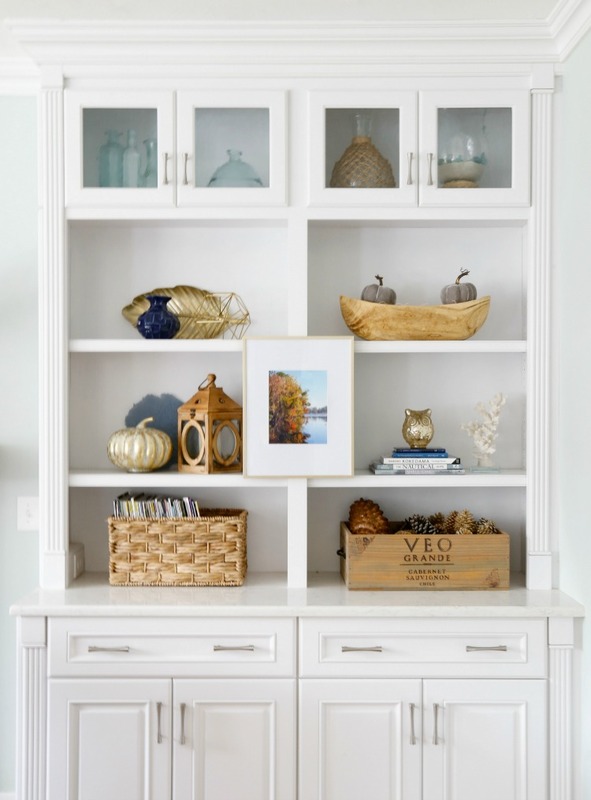 Adding a floating framed picture was a fun addition to our built-ins. This photo was taken on one of our weekend fall boating trips on the river. 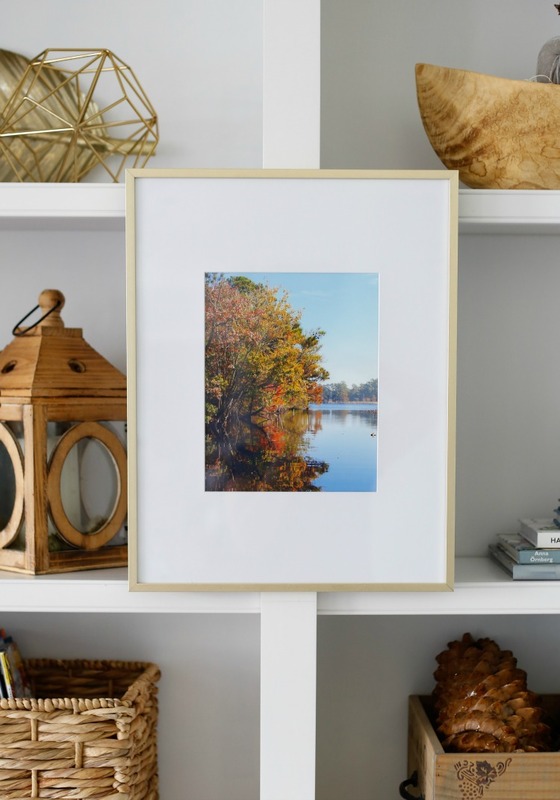 This picture frame is mounted by a 3M Command hook. 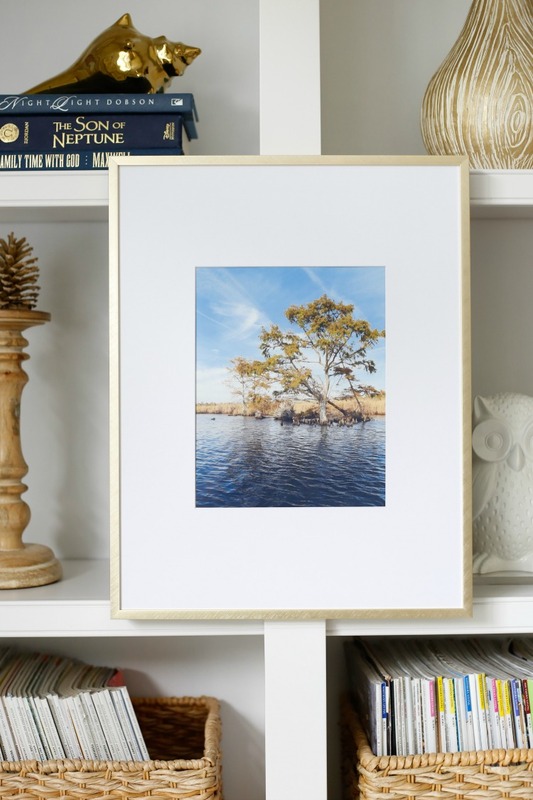 Don’t be shy to showcase your photos and frame them for quick and easy art! The mantel is adorn with contraband!!!!! I asked my kids to collect a handful of “sea oats” for me while they were on one of our local island dunes. Once they gathered a lovely bunch for their mama, someone let them know that there might be a $500 fine for “harvesting them”! OH MY!!! So let’s just say my mantel is SCANDALOUS! I’m living on the WILD SIDE OF DECOR! All my neighbors have beautiful maple trees, but we sadly don’t. I was so excited when I spied a little maple tree randomly growing in my yard behind my hydrangeas. I adore white baby boo pumpkins but none could be found this early in the season, so I painted a little orange pumpkin white with craft paint! Simple and free decor is the best way to go though, don’t you think? Here is the other side of our living room built-in bookshelves. I posted another photo from our fall ventures upon the river. And who can resist a dough bowl filled with pumpkins? This was seriously a 5 minute centerpiece. 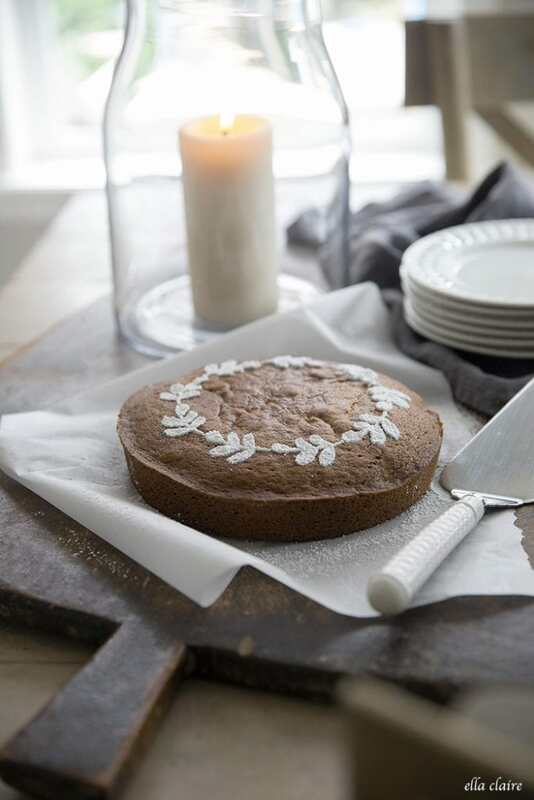 The pumpkin filled dough bowl centerpiece is simply a dough bowl with a towel laid upon the bottom. Then I put 3 faux cinderella pumpkins upon the towel. The towel elevates them! Next I wrapped the pumpkin trio with a fall garland from Michaels and then tucked in a few faux white baby boo pumpkins, bleached pinecones, and dried hydrangeas. Let’s take a look at into the kitchen, shall we? 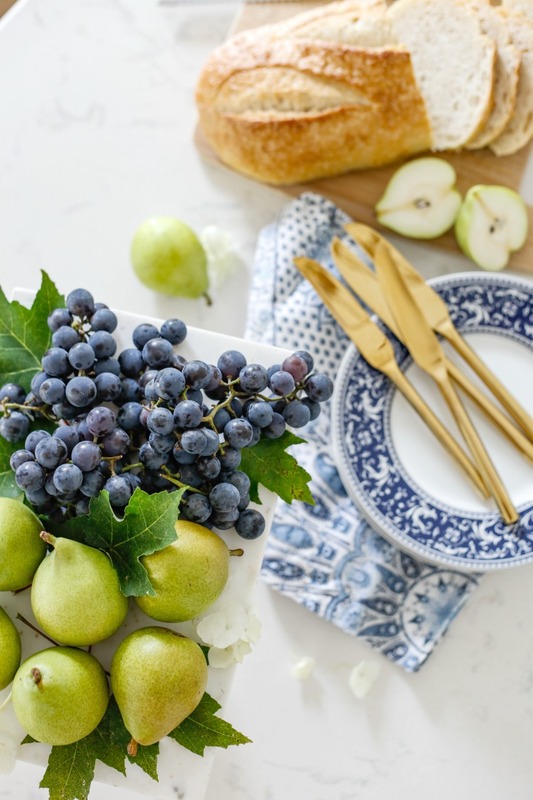 Pretty pears ripening on the window sill, a bowl of honey crisp apples, and maple branches are enough to say “hello fall”! After our recent Hurricane Florence, I am far more aware of everything to be thankful for. This little sign is always a good reminder to have a mindset that “In all Things Give Thanks!”. 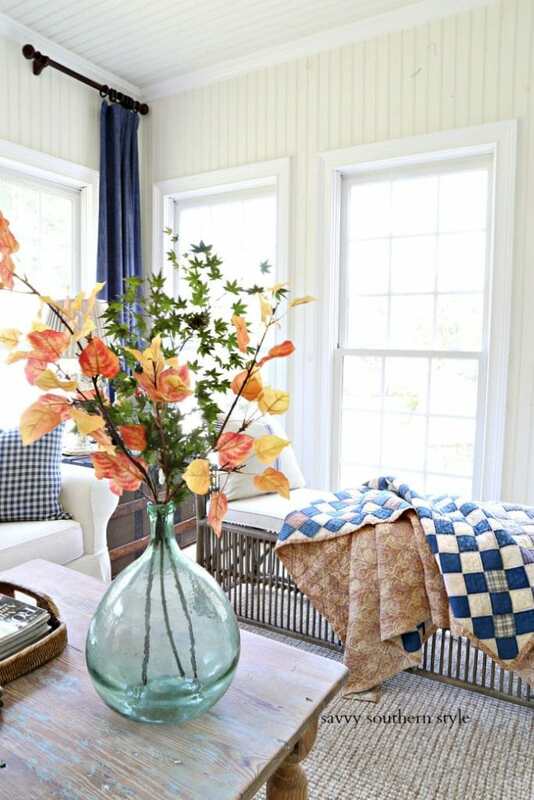 Decorating for fall is simply adding a few touches of what you love most about the season. 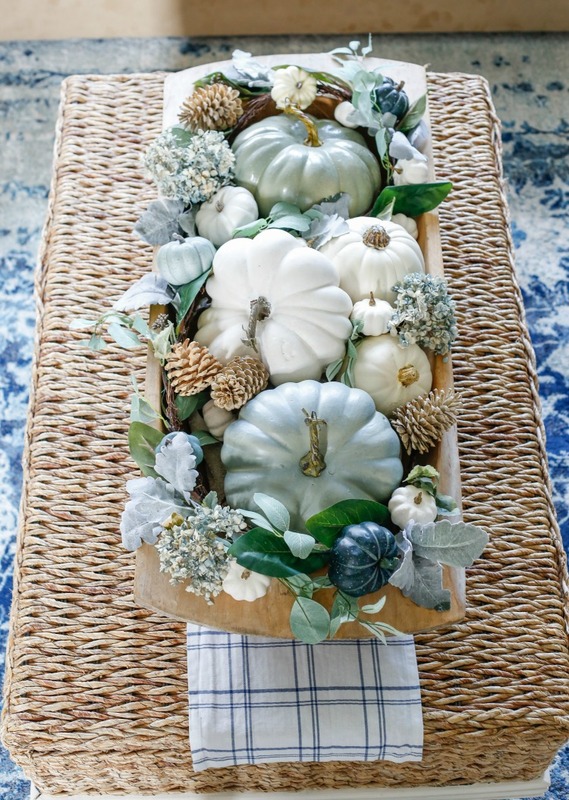 For me, it is white pumpkins, natural grasses, beautiful leafy branches and the bounty of fall produce. 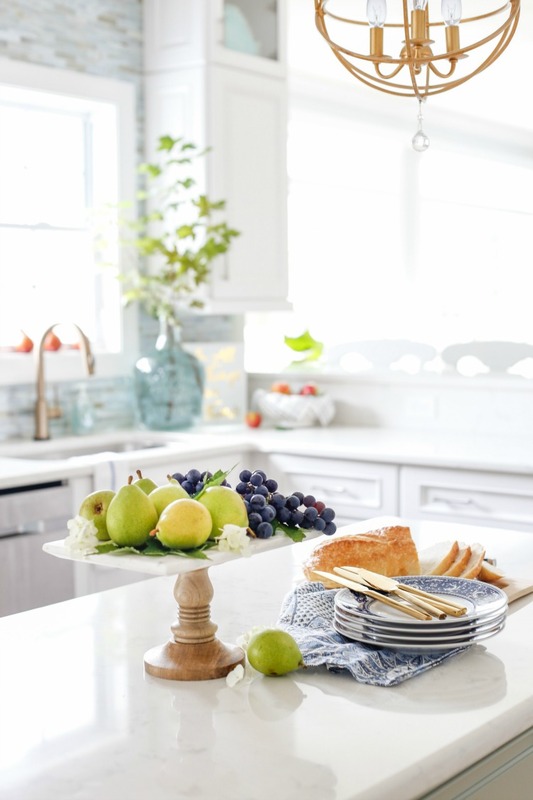 I hope you enjoyed my Navy and Neutral Fall Living Room + Kitchen Tour! Listed below are all the sources for the items in the room. Affiliate links provided for your shopping convenience. Want more amazing fall inspiration? Please check out all the other amazing bloggers for AUTUMN’S IN THE AIR FALL BLOG TOUR hosted by Maison de Cinq! Next up is the beautiful home of Shabbyfufu ! I had to laugh at the contraband and in our beach home I have sea oats too. There’s a sign on our beach warning us of the fines, but I can usually find some torn off after storms. Your home is gorgeous Kim!! Ha! My kids were so nervous afterwards and hid them under a surfboard! I’m raising hoodlums! 😉 Thanks so much Janet! Kim, you know I love navy, too and your rooms are just beautiful! Happy fall!! Hahahaha!!! You just made me laugh out loud! Thank you so much Barb! Have a beautiful day! 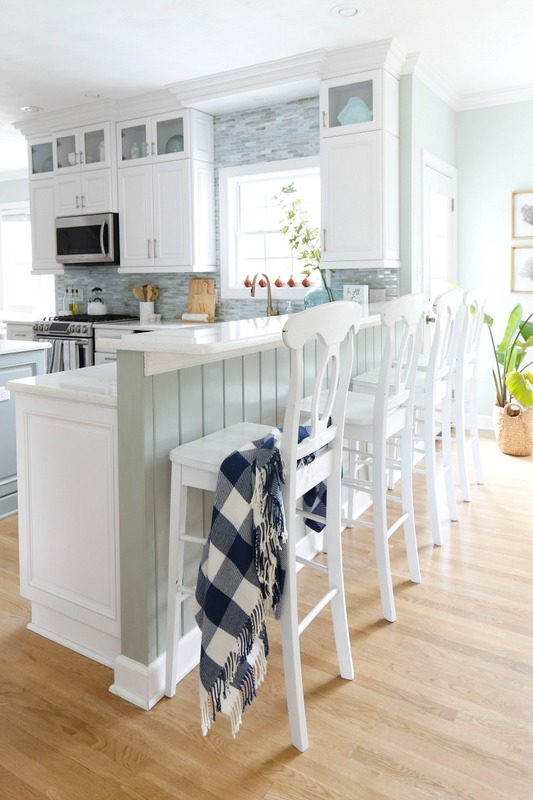 Your house is one of my favorites when it comes to decorating style. 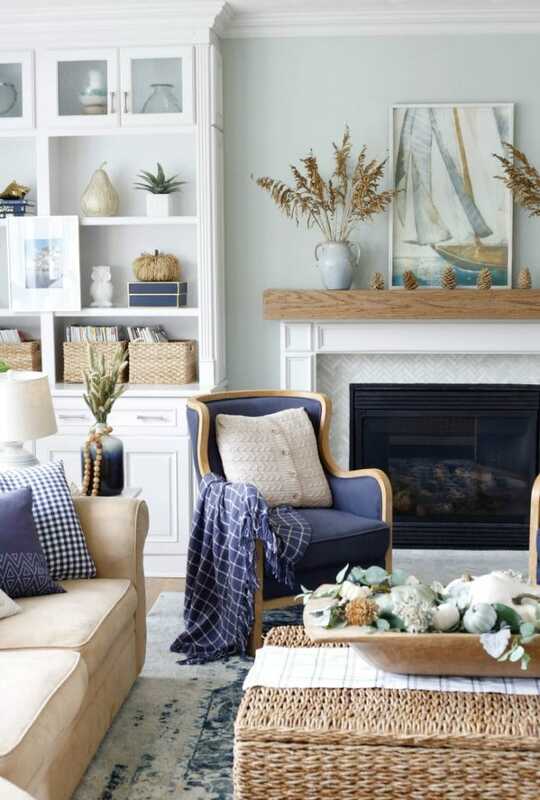 It is very similar to what I picture when I think of a perfect beachy home! The floating picture frames was my favorite addition as these just seem to pop off the book shelves and add so much interest. The colors and texture are so inviting — just gorgeous. Thanks for sharing! 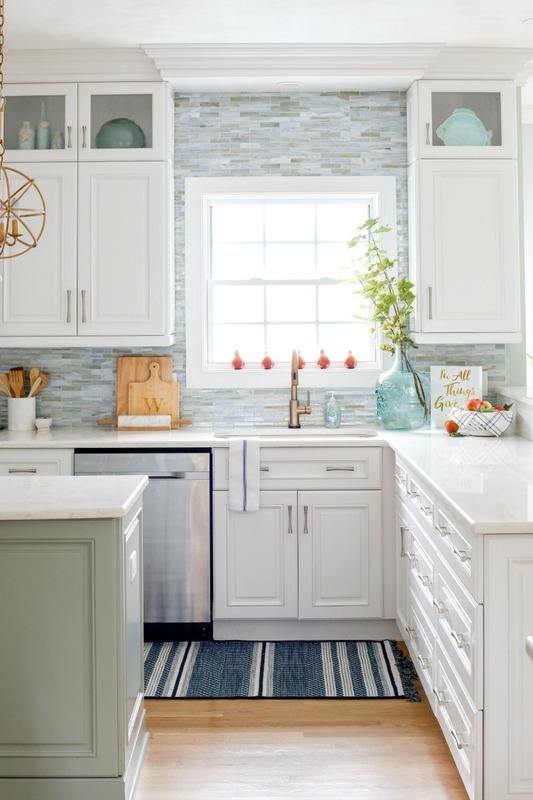 I love your home and especially your accessories! I tried the link for the navy/white buffalo check throw and it doesn’t go anywhere. Is that my computer’s problem? I would love to find one like it! As always, your home is absolutely gorgeous! I love the fall harvest bounty everywhere, and the navy looks both classic and cozy! Thank you Kristin! We are really liking the addition of the navy too! Kim your home looks so gorgeous! 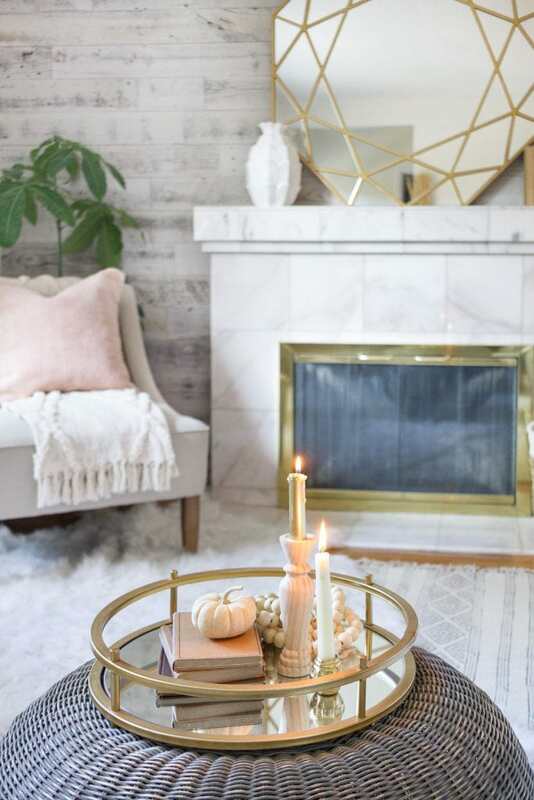 I love how warm and welcoming it feels, with just some subtle seasonal touches to make it feel like fall. So glad you could join us – happy fall to you! Thank you so much Sheila! I’ve had to paint pumpkins for years! Just don’t spray paint them! If you do, leave the bottom exposed. Otherwise they will explode! ….don’t ask how I know that…lol. Wow. I’m so glad I stumbled across this site! Your fall decor is gorgeous- seasonal and classy, but not in your face bright oranges. I came to see the living room..and half an hour later a still hanging out on this site admiring your style. 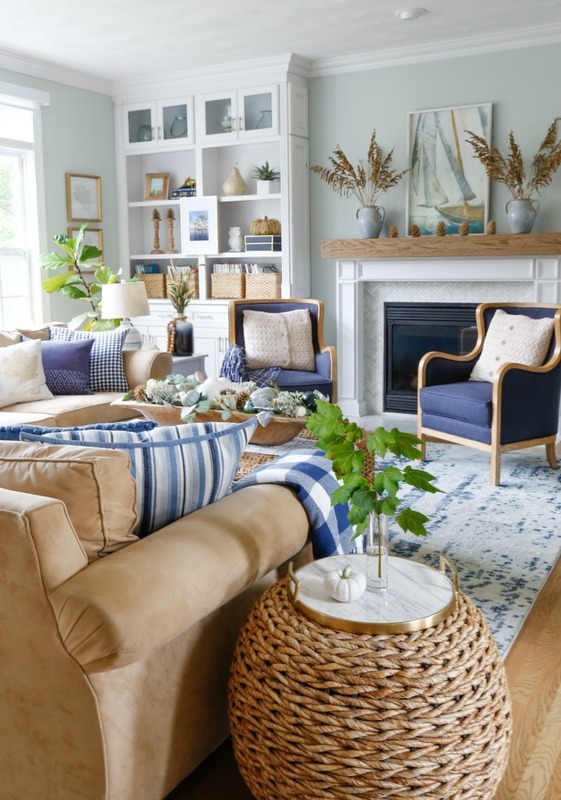 I just came across your blog post from June 2014 and see how classic your coastal decor remains 4 years later! Born and raised in the US southwestern desert, my inner mermaid calls for the cool, summery coastal look! Now working in this industry, I am in love with it! 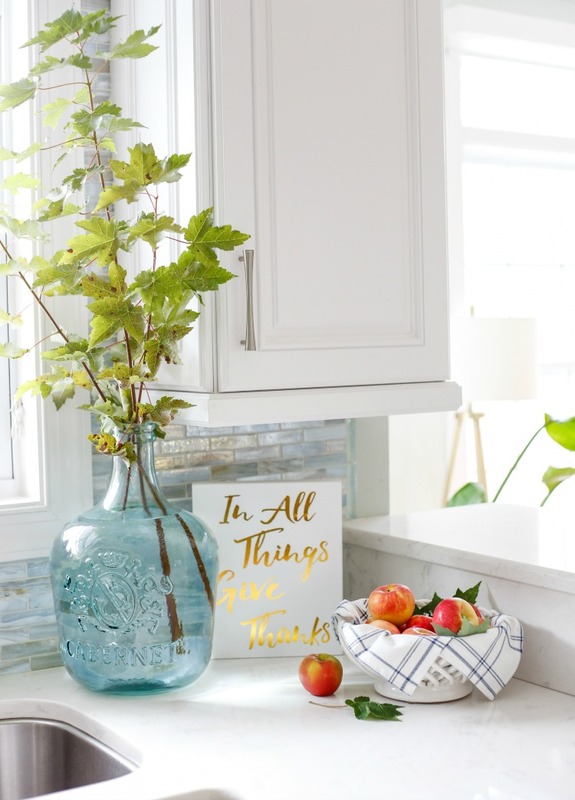 I also have to add that I just love how you so easily added a fresh autumn flair to your coastal look and look forward to seeing what you do with all the seasons and holidays! 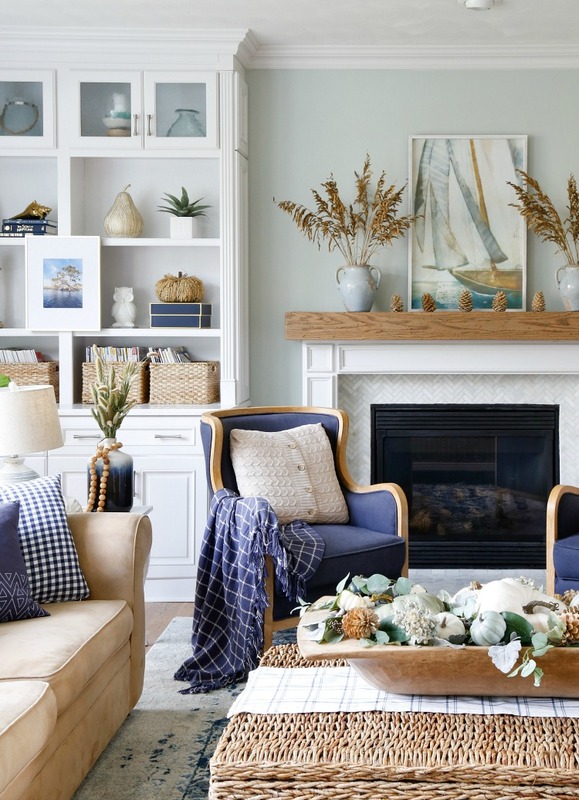 Your talent and insight into coastal decor is inspiring! Cannot wait to implement many of your ideas within my own home! Girlfriend…. you just MADE MY DAY! Thank you so much for your kind comment! 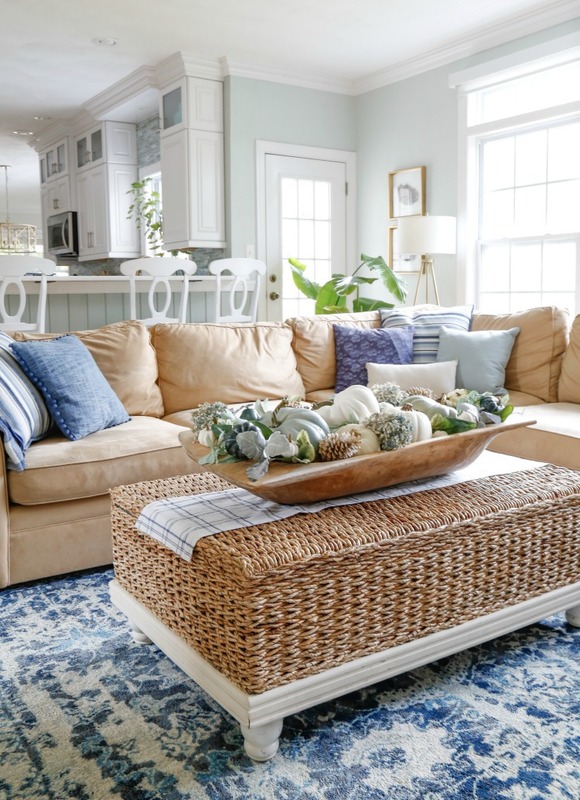 I’ve been blogging since 2010 and hope my coastal decor style and design has developed and matured into something better than it was when I first started. 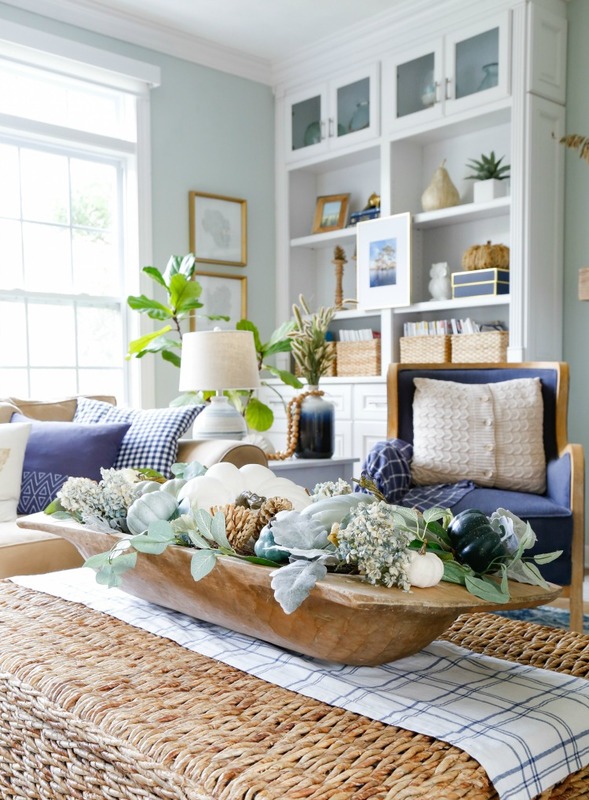 Finally settling into a style I’m comfortable with and sharing how to express our inner coastal mermaid in the chic-est way is what drives me today. Thank you for following along and I hope I keep inspiring you to go “coastal” even in the desert! Thanks for the reply, Kim! I will share my successes with you as I strive to go “coastal” in the desert! Just gleaning ideas presently…and loved what you shared. Hi there. I love your style. It is very similar to the look that I am going for. I have an open kitchen, breakfast nook, family room. I just painted the walls Sea Salt. 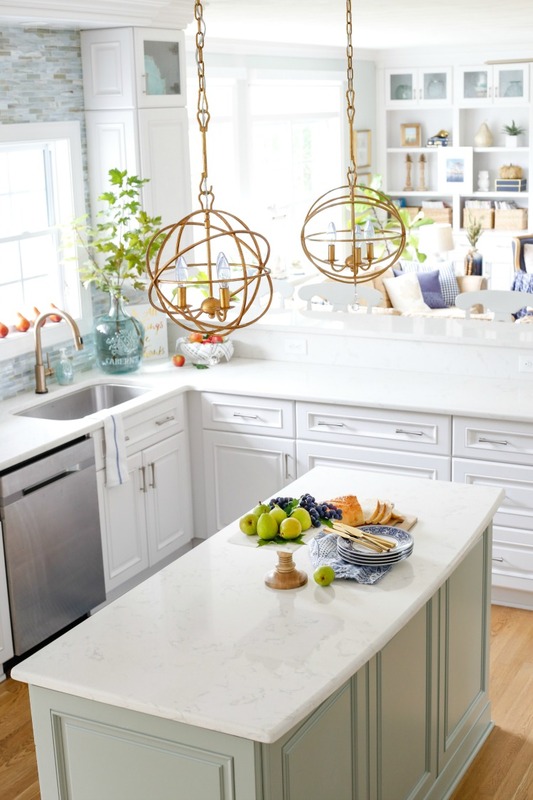 Now I want to paint my kitchen cabinets white as they are currently oak. Decorating is not my forte. Do you do online consultations by any chance? Also I live outside of Richmond, I would love to know if you know of any good stores in the VA Beach area where I could get affordable furniture and accents. Thank you! Thank you so much for your kind comment. I do not offer online design services currently, though everyone is telling me I should! 😉 You don’t need to leave Richmond to find great furniture and accents. Most of my furniture is from Pottery Barn, thrift stores, or HomeGoods/TJMaxx. 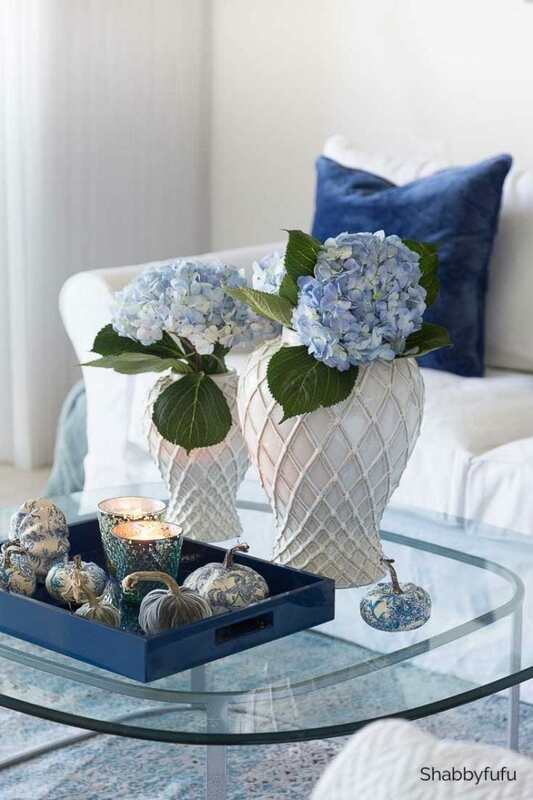 HomeGoods is especially fabulous for inexpensive accents. I hope you like the Sea Salt! It is a crazy color for sure. It is always changing depending upon the lighting situation but is very calming. Hi Dottie! That sailboat painting was from Kirklands a few years ago.